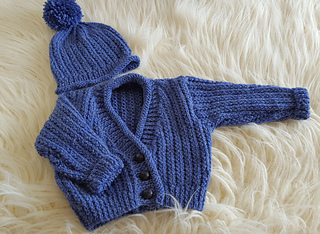 A lovely, easy to knit pattern which makes a super gift for a toddler and would certainly keep him snug and warm in the cold weather. 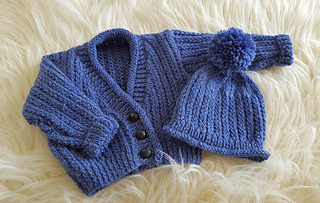 The pattern consists of a v neck cardigan with a rolled hem and a matching pull on hat which can be made with or without the pom pom. 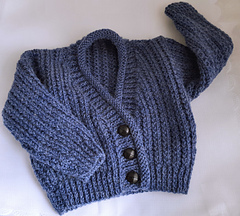 Sized to fit a toddler 12-18 Months with a finished unstretched chest size of 20in. 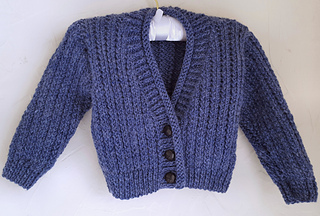 Very simple to knit I would class the pattern as suitable for an advanced beginner. 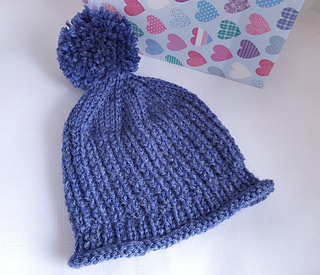 The pattern is very versatile simply add a contrast colour on the hem and cuffs and you achieve a completely different look.